Hey, Back Off! 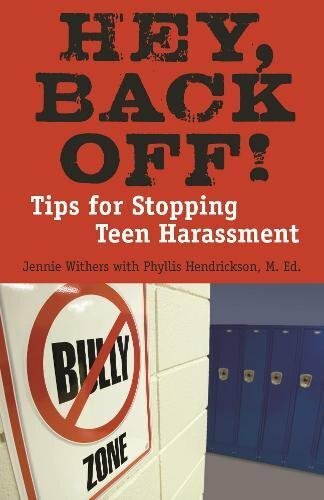 Tips for Stopping Teen Harassment is not only one of the most comprehensive and engaging books on bullying prevention in an expanding array of work on a critical topic, but also a practical, real-world toolkit for teens and parents who are serious about changing themselves and the bullying culture surrounding them. In clear language, the authors show both teens and parent how to become winners in the struggle to survive and avoid harassment, using true case stories, quizzes, and worksheets for goal planning to drive their approach. Busy parents might wish for their children’s schools to deal with the bullying problem instead of having to become involved themselves. But the authors make sure parents understand that they must become advocates for their children and not wait for the school administration to handle this increasingly critical problem. Hats off to Jennie Withers, who wrote the book with Phyllis Hendrickson, M.Ed. Ms. Withers teaches writing to high schoolers, and Ms. Hendrickson has over 14 years’ experience as a high-school counselor. Their combined, real-world experiences with teens and their respect for them is refreshingly obvious. They are storytellers as well as friendly counselors. The authors have provided an in-depth and frank examination of the bullying phenomenon. They give insightful advice on handling and managing aggression from the vantage point of the aggressor as well as from that of the target. Readers will find stories about real people who have dealt with harassment in all its forms: verbal abuse, social isolation, sexual harassment, stalking, cyberbullying, and physical aggression. Most books on bullying focus on how to protect yourself or your child against the bully. Ms. Withers and Ms. Hendrickson acknowledge what few of us are willing to admit: that there’s a bit of the aggressor in all of us at times. At the heart of the book is the belief that aggressive behavior can be modified into assertive behavior without losing one’s effectiveness. The authors show the readers very skillfully how to put this theory into practice—even providing lists of what to say and do when provoked. It is this tactic—literally providing the vocabulary for assertive communication—that makes Hey, Back Off! a standout in the field. Order this one fast before it disappears off the shelves.